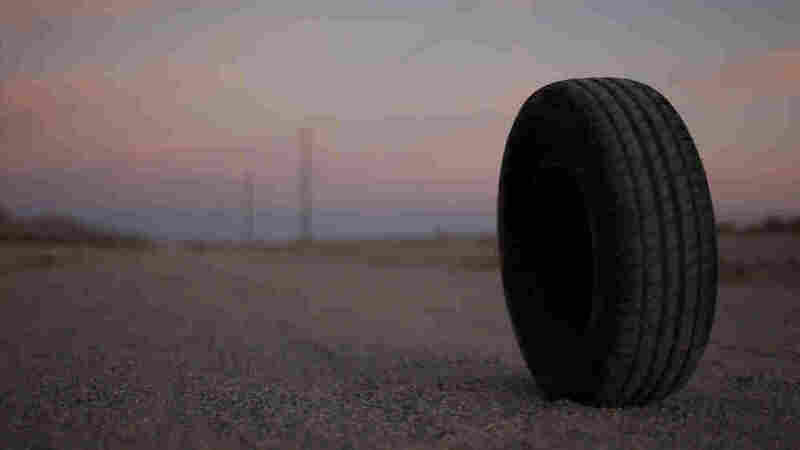 Movie Review - 'Rubber' - Unexpected Turns After 'Rubber' Meets The Road Quentin Dupieux's puckish horror comedy about a telekinetic tire on a violent rampage in the Southern California desert is also a meta-cinematic meditation on the conventions of moviemaking and movie-watching. From a creepy clown doll to a '58 Plymouth Fury, plenty of ordinary objects have been rendered terrifying when storytellers gave them awareness and a murderous agenda; dangers from seemingly innocuous sources are a horror-movie staple, after all. But in the search for new frontiers in everyday menace, filmmakers have been known to go to ridiculous lengths. There was, after all, a 1977 cult film entitled Death Bed: The Bed That Eats. Writer-director Quentin Dupieux's Rubber -- in which an old tire ("Robert," according to the credits) is the sentient killer on a rampage — spends half its time giving such films the lampooning they so richly deserve. But campy satirizing of the excesses of the "[Fill in the blank] Attacks!" genre has been done before (notably in 1978's Attack of the Killer Tomatoes). What sets Dupieux's film apart is its unexpected secondary dimension: an absurdist meta-commentary on cinema itself that hilariously articulates the notion that the movies stop existing the moment we stop watching, like the sound of an unobserved tree falling in the forest. In the film's prologue, Lieutenant Chad (Stephen Spinella), a small-town cop in the dusty Southern California scrublands, delivers a monologue directly to the camera. He makes the point that in the movies, as in life, things often happen for no reason. This "no reason" doctrine, he concludes, is the subject of the film we're about to see. He's talking to an audience, but not the one we think: The camera reveals a crowd of people gathered, and a mousy accountant (Jack Plotnick) hands out binoculars. They're to watch the movie play out through these lenses not on a screen, but in real time, on the landscape spread out before them. Sheila (Roxanne Mesquida) and Lieutenant Chad (Stephen Spinella) are tasked with destroying the tire. Either one of the film's sides — the horror comedy or the post-modernist commentary — probably wouldn't be enough to sustain the movie on its own. It barely manages to fill out an hour and a half, in fact, with both of them intact. But with both facets taken together, Dupieux can have his cake and deconstruct it, too — breaking down walls between the movie's internal audience and the story of Robert, and between us and those two merging worlds, until the whole structure threatens to collapse in on itself. But when even the comic horror and the aesthetic beauties begin to wear thin, what really keeps Rubber rolling is Chad's opening admonition to abandon reason, all ye who enter here. If ever you find yourself thinking that something doesn't make sense, even given the movie's internal snake-eating-its-own-tail logic, don't bother searching for an explanation: There isn't one.